"Community of the Heart" begins with two artists. Friends and collaborators who have been supporting each other for nearly two decades. 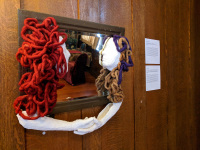 The casts seem to gaze at each other, while the viewer is invited to join their intimate connection by seeing themselves in the mirror in between. No one is excluded from this community. To join? Come look into the box, add your gaze and you’re in. Add your picture. Add your heart. While this was created by two women who come from and draw on Jewish traditions, our vision is to include all who draw near. In Hebrew, the word for nearness (karov) shares a root with the word for the holy sacrifices (korban) commanded by God as a way to be in holy relationship. For this piece to be complete, viewers must look at it. In doing so, in drawing near, each person becomes a part of this community—knowingly or not, each reflected viewer becomes part of the piece. In it, we reflect each other. We connect when we are close. Anyone who comes near gets to be a part of this piece. Artists Susan Duhan Felix and Elizheva Hurvich met in the late 1990’s when they both had pieces featured in an exhibition at the National Museum of Jewish History in Philadelphia. When Elizheva moved back to the Bay Area, the two began to meet regularly, supporting each other’s projects (particularly for what was then known as the “Jewish Arts Renaissance.”) They belong to the same Jewish community, Chochmat HaLev, but come from different backgrounds. Susan grew up in 1940’s Queens in a Secular Jewish Family. Always yearning after the spiritual, she earned a masters degree in Spiritual Poetry. Her thesis was on "How TS Eliot's Wasteland Exemplifies the Lack of Ritual in Contemporary Life." Susan went on to study Judaism and create contemporary ritual objects. A generation later, Elizheva grew up in the 1970’s, a continent away, in an unusual Jewish family with eclectic practices in Marin County. 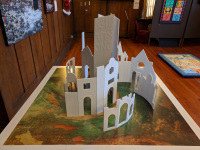 After traveling and living around the work, Elizheva returned to the Bay Area in 1999 with a master’s degree in Jewish Art and Material Culture. Elizheva is a Jewish educator who uses mixed media to communicate her spirit. (Yasi Bayat, Matin Hemmatkhani, Niloofar Mahyari, Parsa Mahyari, Sareh Bakhtaran, Fareen Farhadi, Parsa Shakeri, Reza Torabi, Zahra Torabi, Marisa Torabi, Bita Bonakdar, Sara Torabi, Ali Torabi, Niki Asemi, Amirali Rastad, Ryen Rastad, Melina Mofidi, Matin Mofidi). Eric, Venessa, Sophi from other faith and school participated in this project. The art of carpet design and rug weaving is a genuine Iranian art, rooted in ancient Persia which later blended with Islamic art. The motifs in designing Persian carpets illustrate unique and different stories. 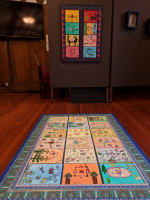 By learning what each motif and symbol illustrates the stories hidden in the pattern and design of each carpet can be deciphered. 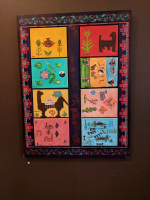 Students of Andeesheh Persian School (aged 5-12) each designed and illustrated their own story and created a mosaic style carpet by mounting their paintings on a wood panel. 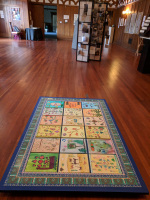 The final artwork is the result of a seven-session workshop in which they learned how to read carpet designs and create their own. Farzaneh Farid Moayer is born and raised in Isfahan- a city famous for its magnificent architecture and artistic ambience- Iran. She is currently living in the Bay Area. She says, she owes her artistic taste and talent to the artistic environment she was raised in. After high school, she came to the United States for her college education and her interest in arts and its effect in creating bounds between people and cultures led her to pursue her education in art and sociology. She is deeply influenced by the great Persian poets, Rumi and Hafez and their poems have inspired her to focus on Love, Peace and Unity. 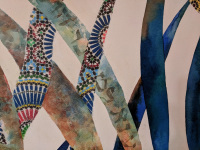 After returning to Iran she pursued her career as an art instructor for over 25 years and taught at various levels from elementary school to college. Currently she is an art teacher in Andeesheh school and other private schools and students. She has held over 40 individual and group exhibits in the United States and Iran. In the Abrahamic faiths, Judaism, Christianity and Islam, the common belief is that there is but one God— an Almighty God, all loving, all knowing, present always and everywhere and all powerful. And while members of the individual faiths approach their divinity differently, heed the particular admonitions of their Prophets, give praise, pray and perform their devotional obligations in unique ways, since there is but one God, they all attempt, we believe, through these distinct means to achieve proximity to the same Divinity. Any place, then, that one prays, but especially any place of worship that one prays in is a place where one’s prayers may be heard by God and a special closeness to God achieved. 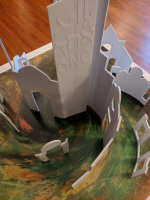 In our desire to create a model for an Interfaith House of Prayer and Worship, we were faced with the challenge of making it either devoid of particular denominational symbols or making the portals distinct and familiar to each faith, yet accessible, welcoming and embracing of/to the others. While our focus has been the Abrahamic faiths, we suspect that the sentiment we strove for extends to many, if not all the other faiths. Fariba Gharai, Associate professor of urban design, studied architecture at the University of Tehran and completed her PhD at the University of Sheffield. She has recently become interested in water color painting with special reference to urban scenery and buildings. Also interested in product design, architectural sketching, and watercolor painting. Barry Shapiro received a doctoral degree in Philosophy from UCSD. After teaching Philosophy to college students and Diversity to private & public sector employees, he returned to school to study MultiMedia. His photomontages are frequently seen in the Bay Area in group and solo shows. As a middle school humanities teacher at Park Day School, Rachel strives to help the next generation understand the world critically and become citizens that transform their communities. 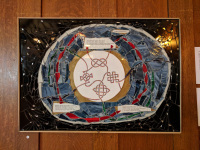 As an artist, she uses calligraphy, paper cutting, and embroidery to express gratitude and connect to Jewish texts that call for justice. This piece reflects my spiritual belief which is all about energy flow. The energy of open-hearted love, peace, just choices, kindness and the energy of ego, greed, hate, fear, all exist around us each moment. What flow we choose affects everything. What connects the 3 of us, and all life… with guidance from The Divine. In Gratitude. I wrote a poem composed of three quatrains (four-line stanzas), one for each collaborator. Each stanza described what I imagined to be each individual’s beliefs and artistic influences. The stanzas’ imagery overlapped and formed a complete poem, as we created a single work of art. Joined in the central drawing are knots based on motifs from Celtic Catholicism, Moorish Islam, and Tibetan Buddhism, plus a knot whose elegant practicality suggests to my mind a healthier view than any religion. I love the way each of our three contributions is so distinct, but speaks to the other two and pulls them together. Dvora Gordon struggled for years to find her place in the world of art, never having taken any classes or had any classical artistic training. Then she was introduced to outsider art, and that is when she knew she had found her home in the world of art and passionate, creative people. She lives there now, and it is good to be home. Hew Wolff likes cats, classical Islamic art, and short walks around his garden. He has been published in Best Bisexual Erotica and Geometriae Dedicata, and lives with his wife in Oakland, California. Jan Steckel is a former pediatrician who stopped practicing medicine because of chronic pain. Her poetry book The Horizontal Poet (Zeitgeist Press, 2011) won a 2012 Lambda Literary Award. Her fiction chapbook Mixing Tracks (Gertrude Press, 2009) and poetry chapbook The Underwater Hospital (Zeitgeist Press, 2006) also won awards. Her fiction and poetry have appeared in Scholastic Magazine, Yale Medicine, Bellevue Literary Review, and elsewhere. Her work was nominated three times each for the Pushcart and Sundress Best of the Net anthologies, won the Goodreads Poetry Contest twice, and won various other awards. Our painting highlights the palm leaf which has been linked to peace, procession and eternal life in Christianity, Islam and Judaism. 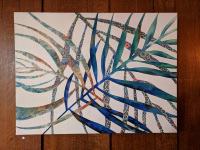 We depict three palm fronds each representing one of these world religions. While each palm retains its own individual motif and distinct “personality,” it also intertwines with its neighbors. Thinking about Nature’s role in religion and the use of its iconography in religious symbolisms, we chose to focus on the simplicity of this beautiful form, creating alternating layers of imagery with a progression from dark to light in our celebration of Nature’s rhythmic patterning and exquisite beauty. As artists from opposite sides of the art-making spectrum, Julie, classically trained representational and abstract watercolor painter working from intuition and emotion and Irys who makes works on paper with mixed media and an underlying conceptual/literary focus, our process was one of integration; widening of understanding, learning and sympathy for each other’s process. We found that community and collaboration require attention to the needs and desires of another which may be wholly unlike ours, but that we can find common ground at the same time negotiating our differences with compassion. With this perspective something beautiful is made that may be enjoyed by all. Julie Cohn is primarily recognized as a colorist and is praised for her powerful and energetic expression of watercolors. Julie has painted subjects from observation for many years. In her current work, she chooses to cull from her memory bank of images to depict subliminal worlds that emerge abstractly, revealing her strong connection to nature and humanity. Her paintings have been featured in numerous solo and group exhibits in the United States, including many museums: the Akron Museum, Ohio: the Redding Museum Redding, California; the Elizabeth S. Fine Museum, San Francisco, California; and Alta Bates Medical Center, Berkeley, California. Her artwork is included in many private collections, the Alameda County Art Commission public collection, and is published in American Art Collector. Irys Schenker received a Post-Baccalaureate Certificate from the San Francisco Art Institute in 1997 and a Master of Fine Arts from the School of Visual Arts in NYC in 1999. Upon graduation she exhibited work in the first Liverpool Biennial in the UK and was a guest at Yaddo in 2002. Irys has also shown her work at E31 and Kappatos Gallery, Athens, Greece, The Newhouse Center for Contemporary Art, Snug Harbor, NY, Asya Geisberg Gallery and White Columns in New York City, The Jewish Museum, San Francisco, and Bronx Museum of the Arts. Her work has been reviewed in Time Out NY and The New York Times. Since relocating to the Bay Area from NYC last year, Irys Schenker was selected as part of the inaugural cohort of studio residents at the 3rd Street Studios Program of the San Francisco Art Institute (October 2016) and had a residency in Paris at La Cité Internationale des Arts in July 2017. The Conference of the Birds is a masterpiece of Sufi poetry describing an inner journey to become one with god. Written in 1177, the poem tells the story of a community of birds who travel through seven valleys in order to reach transcendence and ultimately, death. While the birds undergo an metaphoric journey through seven stages, in the Catholic tradition, the faithful receive seven sacraments- a physical manifestation of the stages one must undergo to reach god, likewise ending in death. In these works by Keyvan Shovir and Lauren Marie Taylor, a community of birds are represented by ships- jets, missiles, rockets and shuttles. This spring, the ‘birds’ will travel through seven stages in order to become one with the universe. The work represents a spiritual relationship between two communities long at war, but with an important history of sharing beliefs and values, especially in relationship to the stars- through astronomy. We highlight not only the spirituality shared between these two communities, but bring awareness to the rarely told narrative of friendship rooted in scientific discovery that has existed for centuries. We hope that by sharing this story, we will inspire a future-focused vision of mutual transcendence. 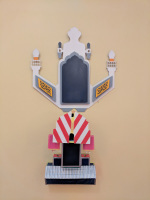 Keyvan Shovir is a San Francisco-based interdisciplinary artist. He was born in 1985 in Tehran, Iran and moved to San Francisco in 2011. He has widely exhibited and presented his work in the United States, Iran, Turkey, England, Italy, Sweden and Dubai. Shovir was a pioneer of street art in Tehran, focusing on social issues and Persian calligraphy. He is primarily known for his work in installation and public art which explores history and Persian myth, language and today’s pop culture. Lauren Marie Taylor is a Bay Area conceptual artist. In 2013 she was the first Artist in Residence at the Arecibo Observatory in Puerto Rico, from which the first message was sent to outer space. In 2015 she was an Artist in Residence at the American Academy in Rome, where she worked with the Vatican Astronomical Observatory. Recent projects include collaborative work on the Man in Space Collection at the Walt Disney Family Museum, Satellite Engineering at California Academy of Sciences, Workshops for BAN 7 at the Yerba Buena Center for the Arts and a solo exhibition at Southern Exposure on science fiction and robotics in the Civil Rights Era. The theme of our artwork is a creative response to the anti-war poem Dulce Et Decorum Est, which refers to a saying from the ancient Roman Empire that means “It is sweet and fitting to die for one’s country.” Wilfred Owen (1893 - 1918) was an English officer in the First World War who tragically died only a week before the war ended. His poem describes the horrors of a soldier dying in a gas attack. He used the phrase “Dulce et decorum est pro patria mori” ironically and calls this saying “The old Lie”. Our purpose is to create a counter argument to the ancient Roman saying, expressing our belief that what is sweet and fitting is making peace between adversaries and building bridges between groups that are in conflict. We believe that it takes more personal courage to engage in peacemaking than it does to engage in conflict. Truly listening to others, expressing concerns, and making compromises to build peace, is more praiseworthy, we believe, than the heroic actions of warriors. 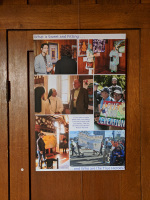 We took these photos at previous interfaith art exhibitions and at other interfaith activities. Alex Madonik is a long-time Berkeley resident and photographer who never gets tired of the beauty of the Bay Area. 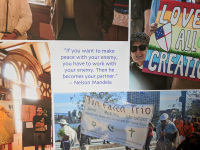 As an active member of the Jewish community who is married to an Episcopalian, he is conscious of the shared history of Judaism, Christianity, and Islam. He has always taken a camera with him while traveling and studying chemistry in Cambridge (MA), Palo Alto (CA), and Rennes (France), and many places since. He wishes he had more leisure for fine art, but for now he’s busy working as a chemistry teacher at Chabot and Laney Colleges and documenting Kehilla’s social activism. This exchange between a visual artist and a poet explores issues of identity, memories of our relatives life experiences in Europe, and how hope is expressed in poetry and visual art. Leah and Lenore are both members of Kehilla Community Synagogue. They collaborated equally in this project; both contributing in their own disciplines. 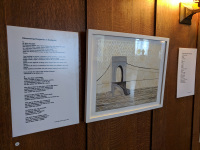 Leah composed “Gazing at the Water from Another Bridge” in response to Weiss’ poem, “Discovering Hungarian in Budapest.” Likewise, Weiss wrote “The Hamza…” in response to Korican’s artwork of that name. This collaboration will build bridges by demonstrating the range of expression that can be evoked through poetry and painting. 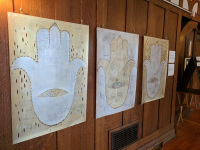 The text in a variety of languages in the Hamsa piece was generated by participants from a wide range of backgrounds during the 2015 Interfaith art exhibit. 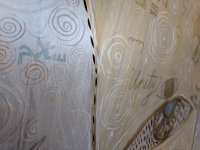 The variety of languages and handwriting creates a polyphony of voices beyond those of the two participating artists. Lenore Weiss recently graduated from San Francisco State University with an MFA (Master of Fine Arts) in fiction. Winner of the Clark-Gross Award (judged by Paul La Farge) and the Robert Browning Dramatic Monologue contest, her poetry has been published in many journals. Books include Cutting Down the Last Tree on Easter Island (West End Press, 2012) Two Places (Kelsay Books, 2014) and The Golem (Hadassa Word Press, 2017). Leah Korican is a visual artist, poet, and teacher who lives and works in Oakland. 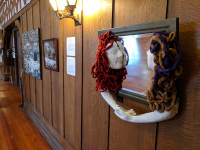 She has exhibited her work nationally and created the permanent art installation at Kehilla Community Synagogue in Oakland where she is a member. Her poetry has been published in anthologies, chapbooks and online journals. Her art was most recently exhibited at Marin MOCA in the AbstrACTION exhibit. She teaches art at the Bentley School in Oakland.